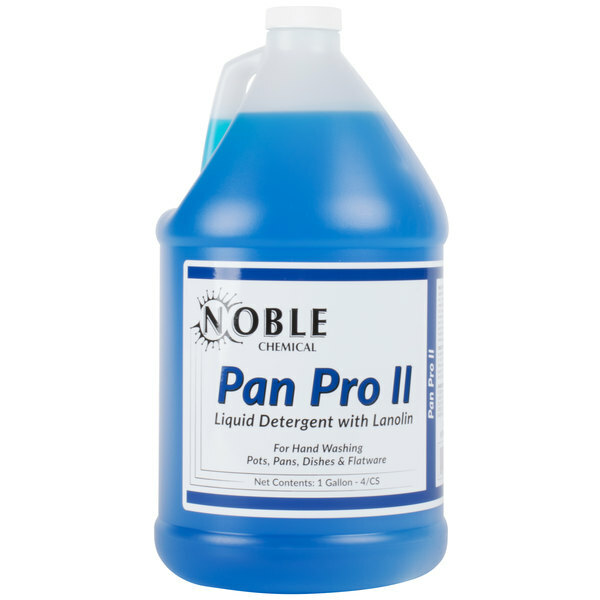 Give your pots, pans, dishes, and flatware the care they need and deserve by hand washing them with this Noble Chemical Pan Pro II pot and pan detergent with lanolin. This liquid detergent includes lanolin, which replaces the natural oils on your skin lost during the washing process, making this soap gentle on hands. Additionally, because this detergent is designed for manual applications, it has high suds that maintain cleaning power. This makes it perfect for use in industrial, institutional, and restaurant settings where grease emulsification and lasting suds are a must. The fresh, clean scent also leaves a pleasant-smelling odor after your dishes are cleaned. The extra concentrated formula allows your staff to use as little as 1 oz. per 5 gallons of water manual dish washing applications. When used in conjunction with a chemical dispenser, this one gallon of Pan Pro II is sure to go a long way! The heavy-duty cleaning power, long lasting suds, and skin conditioning Lanolin are sure to make this liquid dish detergent a must have for your busy kitchen.